Raw food chef Ani Phyo introduces readers to her unique style of Raw Asian American Fusion Cuisine in her new book, Ani’s Raw Food Asia and her 15 Day Fat Blast Diet. This book is the first Asian raw food cookbook to be published and includes recipes inspired by the culinary traditions of Korea, China, Japan, Thailand, Vietnam, Indonesia and Hawaii. In addition Phyo offers comprehensive advice and tips on the raw food lifestyle, fitness, longevity, beauty, entertaining, the environment, and attitudes that support health and happiness. Ani Phyo highlights the ways that raw foods can improve our health and says that everyone can benefit by introducing more fresh produce into their diet. A diet with a high intake of raw food is perfect if you want to detox and cleanse your body, boost immunity, achieve your ideal weight, clear up skin, and eradicate allergies. She explains that her recipes are not only for those who want to eat a 100 percent raw food diet and anyone can add the recipes as a side dish to any meal. She also mentions certain recipes that can be warmed up in the oven or stovetop as desired. The recipes in this book were not designed to mimic or replace traditional cooked Asian dishes, but can stand alone as delicious and healthy meals. Ani Phyo encourages you to take a note of how you feel after each meal because you will probably notice that you are able to focus better and are more productive, which makes you feel better about yourself. Throughout the book Ani Phyo shares her tips on a variety of health of lifestyle topics. Her advice for readers who want to lose weight is to limit the higher calorie foods like sweet fruits, nuts and oils, and allergens such as wheat, dairy, soy and peanuts. You should eat more protein, spices, and greens such as wheatgrass juice, spinach, kale, sea vegetables, spirulina, and chlorella. Additionally eating small frequent meals every three hours or so can help to boost your metabolism. Mango, green papaya, durian, jackfruit, goji berries, kale, cabbage, spinach, mung bean sprouts, cilantro, green onion, chili, lemongrass, Asian lime leaf, young coconut, sea vegetables, shitake mushrooms, sesame seeds, tahini, almond butter, tamari, miso, kelp noodles, dates, agave, stevia. Phyo’s weight loss plan can help you lose up to fifteen pounds in fifteen days, simply by eating delicious raw meals. It is primarily designed for people who are new to the raw vegan diet. However, this program can benefit anyone who wants to gain energy and shed excess pounds. As you learn to replace unhealthy food choices with fat-burning raw foods you will naturally detoxify your body. A nutrient-rich diet will also give you an energy boost, enhance your immunity, reduce cholesterol and eliminate belly fat. You are introduced to what Phyo refers to as “nature’s fast food”. These are raw foods that can be eaten either directly or with very little preparation. Examples include fresh fruit, smoothies and simple salads. Also included are over 50 recipes including Pina Colada, Zucchini Hummus, Italian Salad, Spicy Avocado Soup and Trail Mix Cookies. By following this program you will not only lose weight but also notice a wide range of benefits. Your complexion will improve, you will have more sustainable energy and the aging process will be slowed. Phyo says you don’t have to go 100 percent raw. Just try it for 15 days so that you can experience the rewards from this way of eating. When you have learned which foods make you feel good, you can develop a plan for a long-term healthy lifestyle. The book includes tips to help you continue with some of these new healthy habits after the 15-day fat-blast. Ani Phyo says “in addition to good nutrition. it’s also important to move, stretch, and strengthen our bodies through exercise. The right exercise in the right amounts gives us energy and makes us stronger, while lack of exercise or over-exercise depletes our health”. She recommends a combination of cardio exercise, strength building workouts and yoga for a balanced approach to fitness. Keeping fun and variety in our fitness regime can stimulate our brain and stops us getting bored from doing the same thing every day. 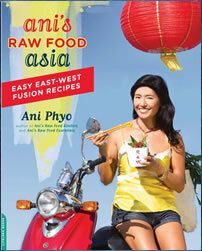 Ani’s Raw Food Asia: Easy East-West Fusion Recipes the Raw Food Way retails at $22.50. Click here to order the book at a discounted price. 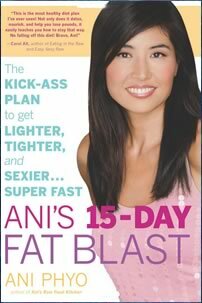 Click here to purchase Ani’s 15 Day Fat Blast. Provides a selection of unique and tasty Asian-inspired raw vegetarian recipes. Encourages the consumption of a high amount of fresh produce. Includes information about sprouting and fermented vegetables. Provides unique advice regarding food and wine pairing. Most of the recipes are easy to prepare. May require the purchase of kitchen equipment such as a blender, food processor, dehydrator, and vegetable juicer. Not specifically designed as a diet for weight loss. Will not appeal to dieters who don’t enjoy preparing food. Some of the recommended ingredients may not be readily available. Ani’s Raw Food Asia is a raw food cookbook offering readers a unique and tasty selection of Asian American Fusion recipes. This book also includes tips and advice related to the raw food lifestyle and general well being and will appeal to anyone who enjoys eating and preparing healthy Asian food.